What happens when you get up and walk away from your PC? I answer a reader's question about setting Windows to secure itself and save power when not in use. For purposes of security and energy conservation, Windows can automatically shut down in several different ways when no one has touched the keyboard or mouse for a set period of time. Here are three particularly useful ways to suspend Windows. All of them, by default, require you to reenter your logon password to regain access. When locked, Windows doesn't power down. Instead, it displays the logon screen--or the screen saver of your choice. This is strictly a security option; it doesn't save power. You set up Windows to lock itself in the Screen Saver dialog box. To get there in Windows 7, click Start, type screen saver, and select Change screen saver. In Windows 8's Home screen, type screen saver, click or tap Settings, and select Change screen saver. When locked, Windows doesn't power down. Instead, it displays the logon screen--or the screen saver of your choice. This is strictly a security option; it doesn't save power.When locked, Windows doesn't power down. Instead, it displays the logon screen--or the screen saver of your choice. This is strictly a security option; it doesn't save power. To lock the screen automatically, check the On resume option and set the Wait option to an appropriate number of minutes. The default, one minute, is decidedly too short. When it sleeps, Windows goes into a suspended, low-energy mode which requires only a trickle of electricity. When you press the power button, it wakes up almost immediately, asks for your password, then takes you back to where you left it. To set this up in Windows 7, click Start, type sleep, and select Change when the computer sleeps. In Windows 8's Start screen, type sleep, click or tap Settings, then Change when the computer sleeps. Once the appropriate applet is up, everything is pretty simple. If you've got a laptop, you'll probably have separate On Battery and Plugged In options. 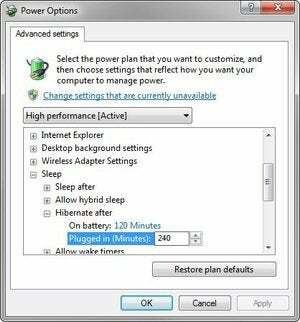 Physically, a hibernating PC is a turned-off PC, effectively using no power at all. Windows copies everything in RAM to the hard drive, then shuts the PC off entirely. When you reboot, everything is loaded back into RAM and the PC wakes up. You'll have to do a little more work to set your PC to automatically hibernate. In the same applet where you set up Sleep, click the Change Advanced power settings link. In the resulting dialog box, expand the Sleep section, then expand Hibernate after, and set the minutes. By the way, you don't have to pick between these three. You can, for instance, set up Windows to lock itself after five minutes, sleep after 20, and hibernate after 120.